my_boatsupply has no other items for sale. There are 10,403 items available. Please enter a number less than or equal to 10,403. Very happy, excellent seller, thx! Perfect, smooth purchase. Great experience. Thankis! Great product!!!! Awesome seller!! Will definitely buy from again!! Thank you!!! just what i order thanks. This is a replacement horn for one that became rusty and inoperative in our boat. I like the fact that it is made up of stainless steel and plastic, which will not rust. Installation was easy, although I did have to enlarge the mounting hole slightly. Existing wiring went right on. Horn puts out plenty of sound and has a good, bold tone. I finally got my dream boat, a Hurricane deck boat. It was all I wanted except it has the wimpiest sounding electric rattle horn you ever heard. 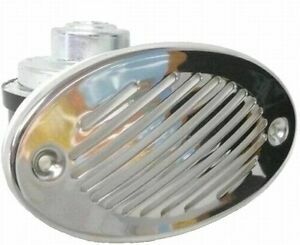 I ordered this horn and after cutting a larger hole in the boat, installed easily. Now i have a clear auto style horn that sounds better and fits a nice boat. This is the second horn I have installed (two different boats). This is the only horn, that with a little modification, fits in this type location and has a strong sound. Well worth the small investment. I highly recommend. A good replacement assembly for 2006 Crownline boat. The horn and faceplate was of decent quality. Required some grinding to fit the opening on the boat. This was replacing another fiamm assembly. Horn itself was a little bit different but with some grinding of the opening fit fine and worked well. horn was delivered quickly, installed and worked well. loader then the original horn that came with boat which had to be replaced every year. this horn is a little larger and different manufacturer. have to wait a year to see if it holds up better.